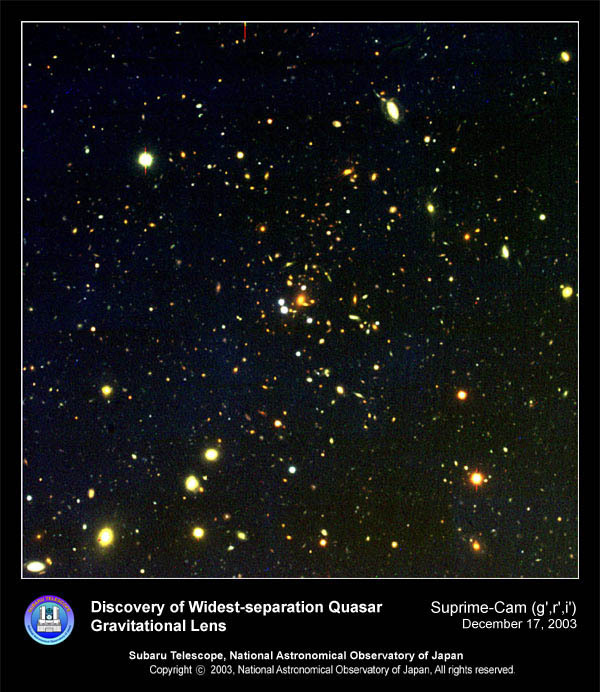 A scientific research project called PISCES (PI: T. Kodama (NAOJ)) is currently being undertaken with Subaru Telescope, which is aimed to obtain a panoramic view of cluster formation and the galaxy evolution therein. This image was taken as a part of this project, showing a central region of a rich cluster located 7 billion light years from us. 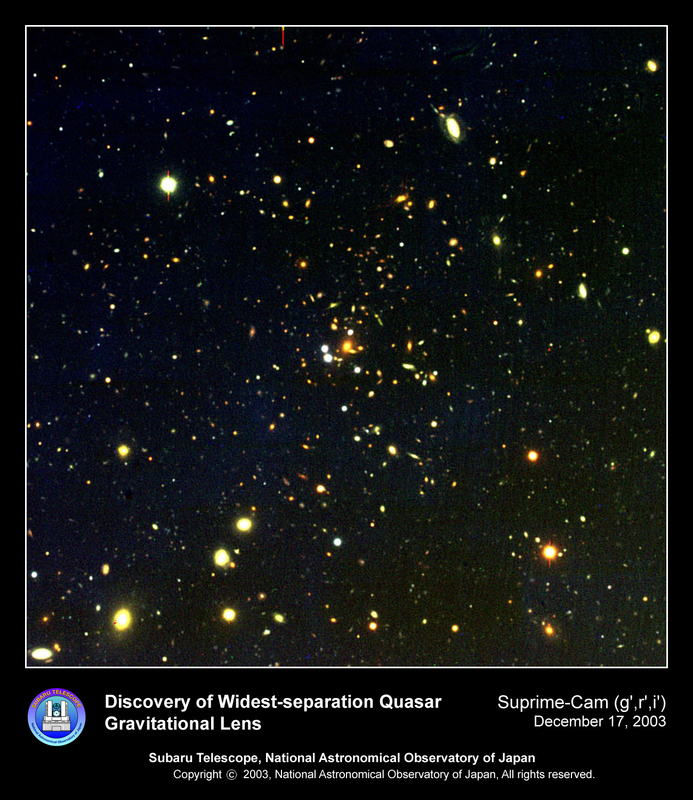 The group of the international observation project SDSS (Sloan Digital Sky Survey) from Japan, USA, and Germany discovered a quasar gravitational lens whose apparent separation between each image is the largest value so far. This is the first one deflected by a cluster of galaxies. The Subaru's observation data largely contributes to this research. Subaru telescope has discovered a minuscule galaxy, less than one hundreth the size of the Milky Way, that may be one of the early building blocks of larger galaxies that populate the Universe today. The galaxy as we see it existed only one billion years after the birth of the Universe, which is now about 13.7 billion years old. COMICS (Cooled Mid-Infrared Camera and Spectrograph) is the instrument which observes the mid-infrared, the longest wavelengths among the Subaru instruments. Mid-infrared spectra from the Cooled Mid-Infrared Camera and Spectrograph (COMICS) on Subaru telescope show the first direct evidence of crystalline silicates in a proto-planetary disk surrounding a Sun-like star. During Mars' close approach to Earth on August 27, 2003, IRCS and NHK's Ultra-High-Sensitivity High-Definition TV camera took a near-infrared image of Mars. Gamma-Ray Bursts = Hypernovae ?! Observations by astronomers from NAOJ, the University of Tokyo and the University of Texas using the Subaru telescope confirm that the optical counter part to gamma-ray burst GRB 030329 is a hypernova. The FOCAS spectra of the optical after glow of the burst show all the characteristics of a hypernova spectrum. This is the first gamma-ray burst with spectra that show such a clear resemblance to hypernovae. Researchers from the University of Tokyo and the National Astronomical Observatory of Japan discovered 18 distant supernovae using Subaru telescope's prime focus camera, Suprime-Cam. A single exposure alone showed 12 new supernovae. This is the first time so many supernovae have been discovered at the same time. Scott S. Sheppard and David C. Jewitt from the University of Hawaii and their colleagues have discovered eighteen new Jovian satellites since the beginning of 2003 using Subaru Telescope, the Canada-France-Hawaii Telescope, and the University of Hawaii 2.2-meter Telescope atop Mauna Kea. This brings the total number of Jupiter's moons to 58. The team discovered 40 of these since 2000. Subaru telescope has found a galaxy 12.8 billion light years away, the most distant galaxy ever observed. This discovery is the first result from the Subaru Deep Field Project, a research project of the Subaru Telescope of the National Astronomical Observatory of Japan which operates the Subaru telescope. Subaru Telescope has successfully taken a sharp and deep infrared image of the star-forming region, S106. In addition, many objects with masses less than that of an ordinary star have been discovered in this region.